iPod and Apple’s iTunes software make terrific music together. Best of all, Mac owners get iTunes free just for owning a Mac. Using iTunes controls, you can listen to CDs, burn your own CDs, listen to Internet radio, watch videos, organize your music (by name, artist, time, album, genre, rating, play count, and more), create customized playlists, create ringtones for your iPhone, and more. Back/Forward: The double arrows pointing to the left and right are your back and forward buttons, respectively. Place the cursor above these buttons and hold down the mouse to rewind or fast-forward through a song. If you instead single-click these arrows, you’ll advance or retreat to the next or previous track. Play/Pause: Click the single arrow pointing to the right to play a song. When a song is playing, the button changes to two vertical bars. Click again to pause the music. Alternatively, press the spacebar to play or pause. Volume: Dragging this slider increases or decreases the volume, relative to your system volume settings. Cover Flow: You can take advantage of the Cover Flow view from any Finder window. To find music, you can rummage through album covers just as you once did with physical LPs. But if you prefer, you can view the contents of your iTunes stash using List view or Grid view instead. 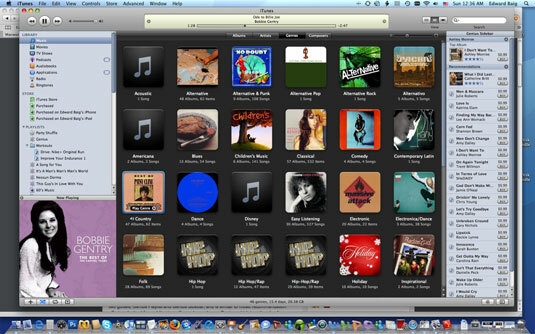 Grid view: Apple’s new iTunes Grid view interface uses album covers, too, but the approach is somewhat different. Basically, a collection of your music (or movies, TV shows, podcasts, or audiobooks) is lumped together in a group representative of, say, a singular artist or genre. Atop the group is cover art. As you mouse over the group, the art rapidly changes to other album covers (or whatever) in the group. When the selection you have in mind turns up, you can play it with a single click. Shuffle: When the symbol in this button is highlighted (it turns blue), tracks play in random order. Repeat: Click once to repeat all the songs in the library or playlist you’re currently listening to. Click twice so that the number 1 appears on the button. Only the current track will repeat. Equalizer: If you’ve ever tweaked the treble and bass controls on a stereo, you’ll appreciate the equalizer. It allows you to adjust sound frequencies to match the genre of a song, the speakers on your system, or the ambiance of the room in which you’re listening. Choose Window→Equalizer to display the equalizer window. You can manually adjust the equalizer by dragging the sliders or choose among more than 20 presets (such as Bass reducer, Flat, Hip-Hop, or Lounge). To bring up those presets, click the pop-up menu in the window. Visual Effects: These funky psychedelic light animations and 3D effects dance to the beat of whatever’s playing. You can drum up your visual serenade by pressing Command+T or choosing View→Show Visualizer. You can also choose the types of visualize effects you get in the View menu. In addition, a number of visualize plug-ins are on Apple’s Web site and other cybersources. For a full-screen effect when the visualizer is active, press Command+F; press Esc or click the mouse button to return to reality.